Sweet Spiced Pumpkin Wontons with Brandy Caramel | "Il faut goûter"
Here’s one sweet delicious realization of my pumpkin wonton dreams! This is a winning dessert or appetizer for the season! And the Brandy Caramel is so good you’ll want to lick the plate–which I did, like the classiest cat with a sweet tooth. You’ll be so pleased…Make these! Beat the cream cheese, pumpkin, spices, sugar, and vanilla with a mixer (or fork if you want a workout) until smooth. Then beat in the egg and the flour. Refrigerate the filling until ready to use. Fill each wonton wrapper with about 2 teaspoons of the filling, then fold and seal the wontons (via package directions or your own creativity) and fry them in hot oil until golden brown. Serve warm or room temperature, and drizzle the caramel over just before serving! In a saucepan over low heat, stir the cream and brandy into the caramel just until incorporated and the caramel is smooth and “drizzlable.” Don’t bring the sauce to a boil. Drizzle warm or cool over the freshly fried wontons. *Did you know that you can make delicious buttery caramel from a can of sweetened condensed milk?! This is so awesome! Take 1 (14 oz.) can of sweetened condensed milk. Put it (the whole can!) in a large pot and cover it with water. Bring to a boil. Reduce the heat a bit, to medium or medium-high (water should still be boiling). Cover and boil the can of sweetened condensed milk for 90 minutes. After 90 minutes, remove the can (careful, it’s hot!) from the pan. When it cools, open it up and you have a whole can of CARAMEL!!! You can thin it a bit (as above) to make a caramel sauce for ice cream and other desserts. If you don’t want to make this caramel, you could use the Caramel Apple Dip available at grocery stores to make the Brandy Caramel. Or just add brandy to a store-bought caramel sauce, and add enough cream to thin it out. 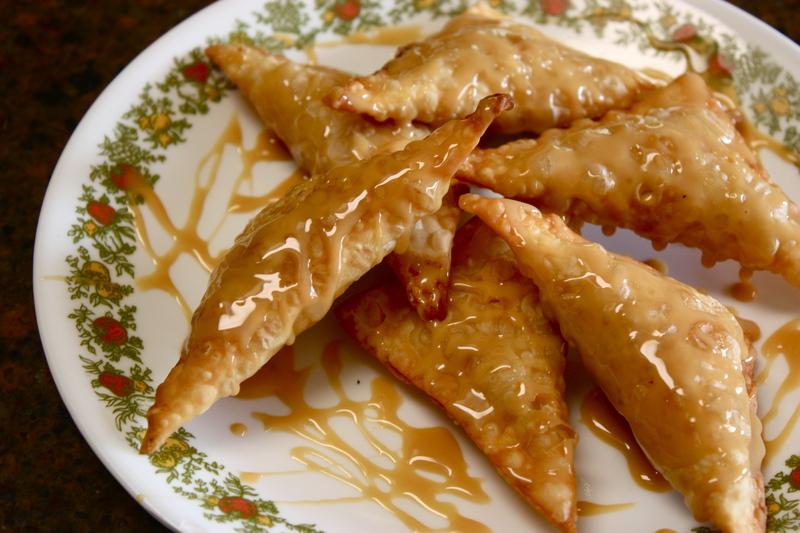 This entry was posted in Sweet and tagged brandy caramel, canned pumpkin recipe, caramel from sweetened condensed milk, dessert wontons, food, recipe, sweet pumpkin wontons by needtotaste. Bookmark the permalink. This is so cool. I love the sauce too.